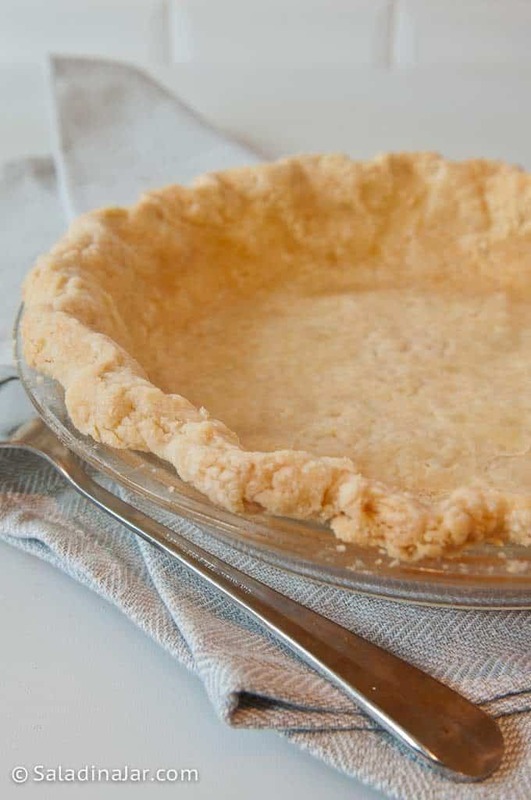 All-Butter Pie Crust recipes are everywhere. But sometimes they give me problems. 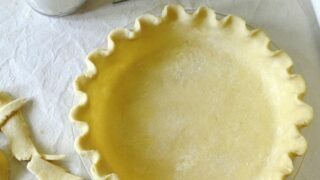 Now I’m sharing how to make a pie crust that uses part butter and part shortening. The result? A perfect combination of buttery flavor with the flakiness and stability provided by the shortening. I once did a cooking show before cooking shows were cool. No surprise. You would have had to get up at 5:30 on a Saturday morning to watch me. Not exactly prime time. Part of my job as a county extension agent back in the 70’s was to do a short cooking demonstration for a local TV station. Why I picked the subject of pie crusts is a mystery now. Little did I know how many pie crusts it would take to get my technique down. Nevertheless, crust-making has turned out to be a fairly useful life skill. Never mind that most people these days are perfectly happy with a pie crust from the supermarket. At this point in my life, I’ve tried what seems like hundreds of variations. In the end, I come back to this recipe when I want to make sure my pie crust turns out beautiful and flaky. In my experience, most all-butter recipes tend to shrink once baked. This is especially catastrophic when you are baking a pie shell without a filling. I know what you’re thinking and Yes! Dried beans, pie weights, chains, as well as twisted parchment paper snakes–tried them all. Of course, no dough-stretching (a common reason for shrinkage) is allowed in my kitchen. Chilling/freezing the dough once it has been placed into the pie plate helps, but it’s no guarantee. So…. I keep coming back to this recipe. You can use a food processor to mix the dough, which is how I do it most often. However, the pictures that follow show doing it the old-fashioned way. By hand. Guess it depends on whether you want to wash all the parts of a food processor or use some elbow grease with a fork or pastry blender. 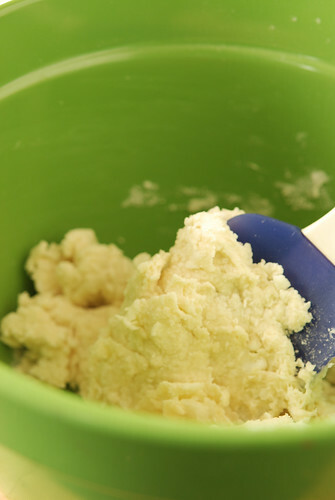 Use fork, pastry cutter or food processor to cut fat into flour. Sprinkle ice cold water over flour mixture and start to compress into a ball. Only use as much water as necessary to make a shaggy ball. 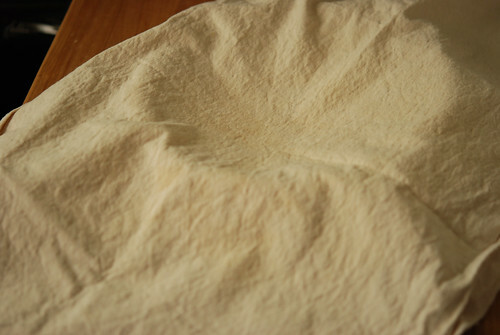 Dump crumbly dough onto floured cloth. 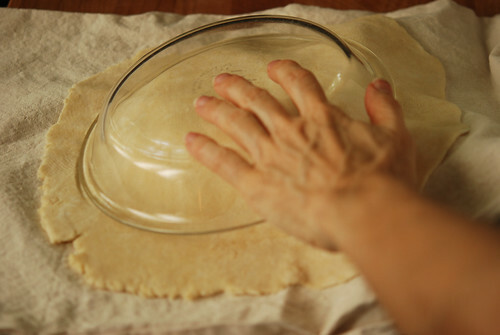 Put your hands underneath the cloth and use the cloth to press the dough together. This keeps your warm hands off the dough so the fat doesn’t melt. Also keeps the sticky dough off your hands. 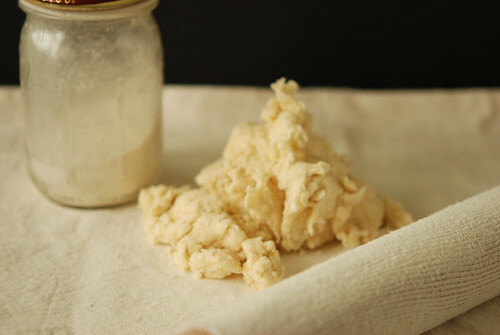 If dough is too sticky at this point, put more flour on the cloth–not the dough. 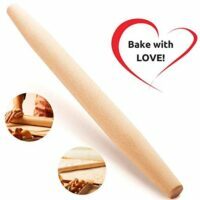 Use rolling pin to roll out dough, making strokes starting at the center and going outward at different angles in opposite directions like you are going around a clock. Strive to keep your circle symmetric. 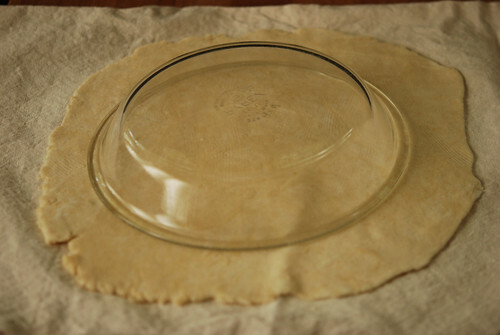 When you are satisfied your crust is large enough and thin enough, place empty pie plate upside down on top of dough. The tea towel will end up on top. Peel the towel off of the crust. It may stick in a few places. 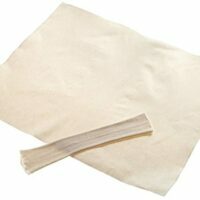 Use a knife to carefully free the dough from the cloth. 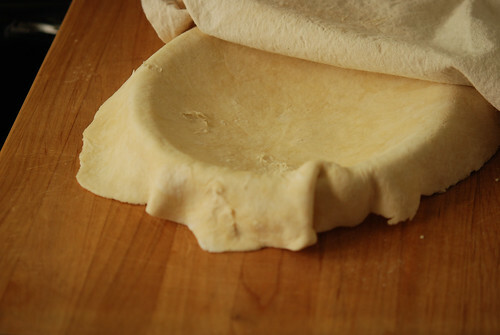 Fold overhanging dough up under the edge to make it even with the side of the pie plate. 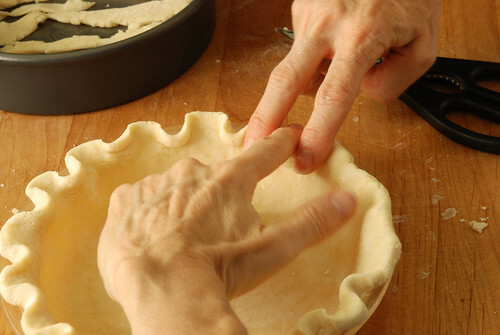 Pull your fingers in opposite directions to make a ruffled affect. 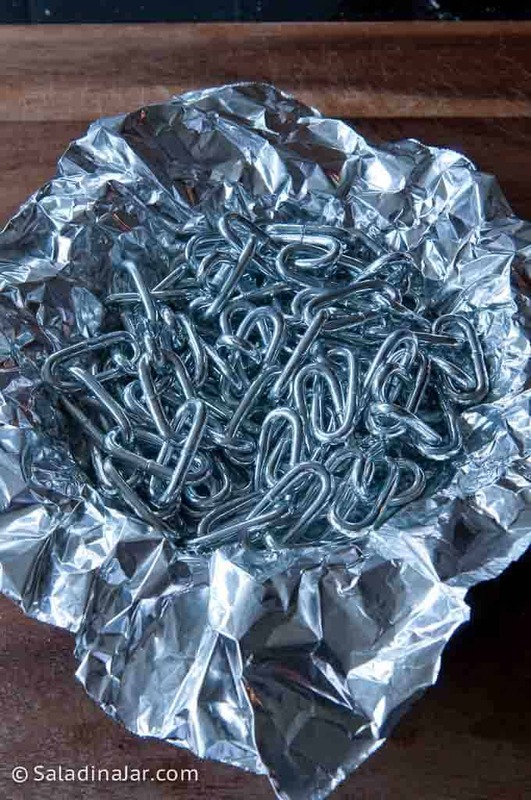 If you need to bake the crust before you add the filling, my favorite method today is using stainless steel chainlink. No more spilled/storing dried beans or pie weights. Even better, they are good and heavy. Chains like the one pictured are sold by the foot at hardware stores or online. 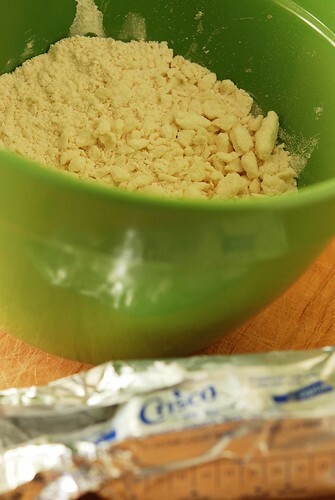 Line your raw pie crust with non-stick aluminum foil or parchment paper. Use your hands to force the foil to conform to the crust. 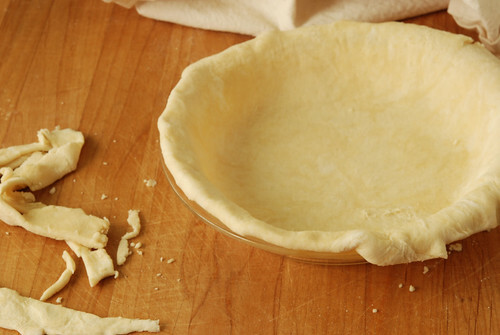 Finally, drop your chain inside of the pie crust before you put it in the oven. Don’t roll your dough too thin. It can easily tear and stretch. Don’t roll your dough too thick. It will be hard to cut in the pan and messes up the proportions of dough to filling. Don’t let the crust get too brown or it will give the flavor a bitter vibe. Go for golden brown–not toasty brown. 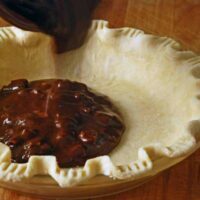 No matter what crust recipe you use, always spray your pie pan with something like Baker’s Joy to keep the crust from sticking. 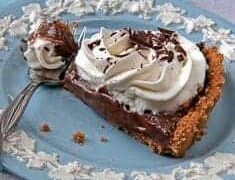 Chocolate cream pie filling (made in the microwave)--recipe for graham cracker pie crust included. 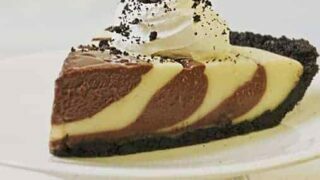 Using both butter and shortening as the fat in a pie crust recipe combines the flavor of butter with the flakiness and stability of shortening for an outstanding pie crust. 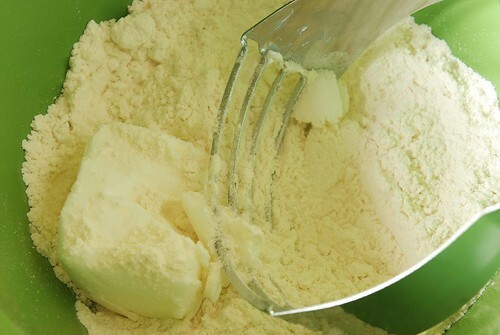 Use fork, pastry cutter or food processor to cut butter and shortening into flour. Sprinkle flour over a pastry cloth or tea towel and work in with your fingers. I also use a special sock on my rolling pin that comes with the pastry cloth. Work flour into it also. 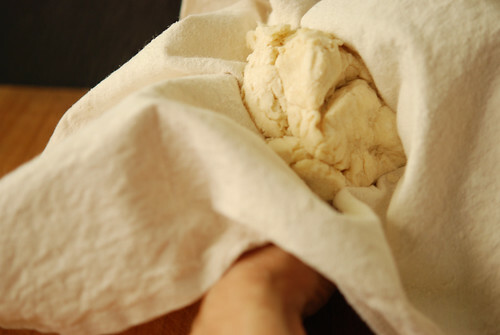 Put your hands underneath the cloth and use the cloth to press the dough together. 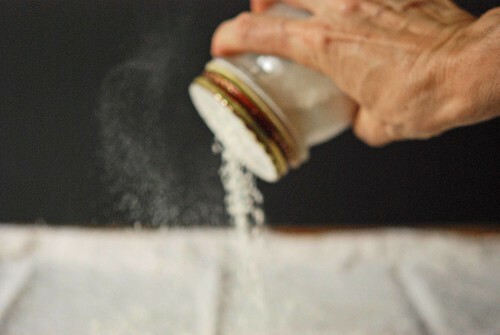 If dough will not come together, sprinkle a few drops of water over dough until it does. If dough is too sticky at this point, put more flour on the cloth--not the dough. Divide the dough into 2 discs. Place in refrigerator for at least 15 minutes or until ready to roll. 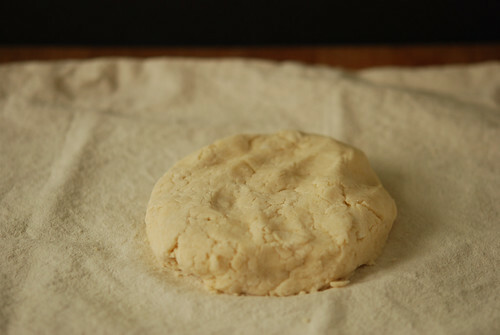 Remove dough from refrigerator and allow to warm slightly. 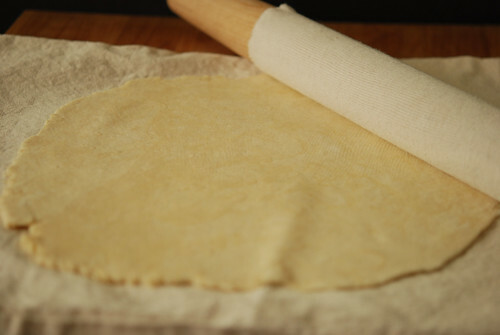 Use rolling pin to roll out 1 disc of dough, making strokes starting at the center and going outward at different angles in opposite directions like you are going around a clock. Strive to keep your circle symmetric. 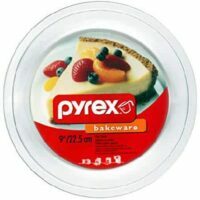 Spray pie pan with flour/oil aerosol like Baker's Joy. 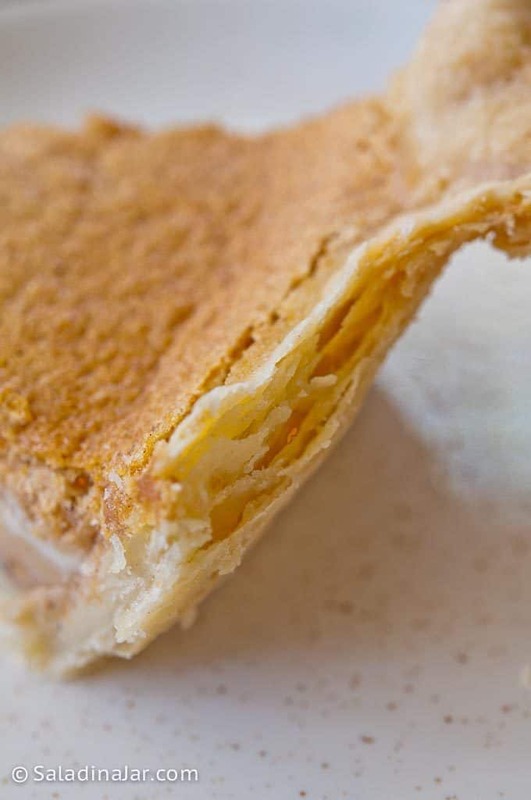 Carefully, scoot your hand underneath the pastry cloth and flip pie crust upside down. The pastry cloth will end up on top. Peel the towel off of the crust. If crust sticks to the towel, use a knife to carefully free the dough from the cloth. Trim crust with cooking scissors or a knife leaving about 1/3-1/2 inch overhang. Place finished piecrust in the freezer for at least 30 minutes. Repeat steps 10-18 with remaining pie crust disc. Bake in a preheated oven at 375 degrees F for 25-30 minutes. 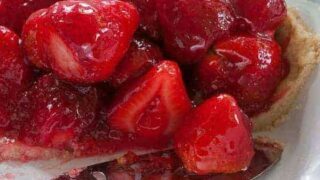 Remove parchment paper or foil but don't throw it away. It's reusable. Use a knife or toothpick to carefully puncture any bubbles (making the smallest incision possible) to let the hot air out and gently press the dough back down against dish. 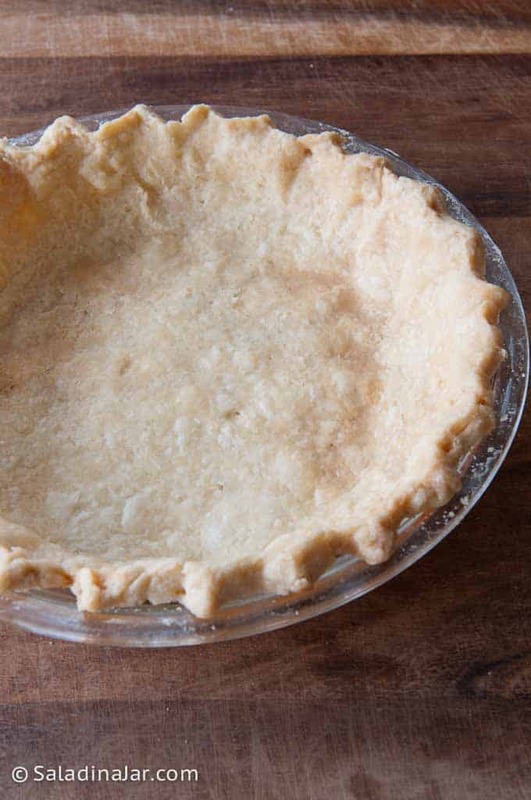 If your pie crust shrinks down into the pan, more than likely you stretched it while rolling out or you neglected to freeze the crust ahead of time. Put crust back into the oven and bake 5-10 minutes until golden brown and crispy. Watch carefully that it doesn't brown too much lest your crust taste slightly bitter/burnt. That is awesome. I love the crimping. I was just “complaining” that I really stink at pie crust crimping. I try. But need to try harder to make it look better. Love your tutorial! Thanks. 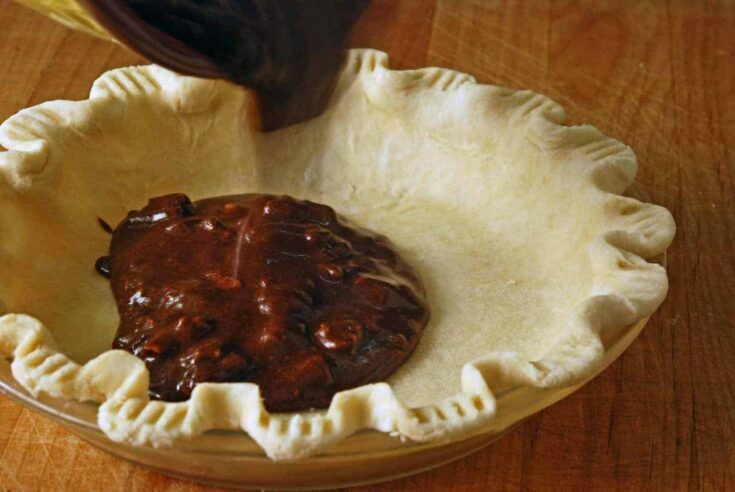 I never buy pie crusts because I think that it is too easy to make one. Then I never make pies because it seems like too much trouble to make a crust. You don’t get anywhere if you are cheap and lazy! What a beautiful pie crust! I always like them better homemade! I will have to try your method! Is this recipe for two crusts or one? These recipes will each make 2 single crusts for 9″ pie or 1 double crust. Thank you! I will start practicing this after the holidays.